Have you ever even played Dungeons and Dragons? That’s what so many advocates have said to me so many times before I finally took the plunge a couple of Christmases ago. And believe me, I get it. I get why they get so excited about it. It’s an opportunity to get lost in a role and play out a character for a period of time. With all the risks and rewards of a narrated life. But it’s that labour of creating the character and learning all of the rules, which by the way, there is always a chance your character will get killed off. Who the heck is Breck Eisner, and why is he directing a Vin Diesel movie? Argh, Vin Diesel is an avid D&D player and has exactly the casting type to pull off the character of an ancient warrior who fights witches! This movie feels like it could be tons of fun, and yet it doesn’t quite get there. So why, oh why, did the guy who directed Sahara and The Crazies land this film? Well, I suspect it had a bit to do with the fact that Vin Diesel is already the helm of 3 other action franchises and I heard he pushed really hard to make this movie a reality using his own money to fund the project. Is the movie really terrible though? Why don’t I give you a tease of the story first. 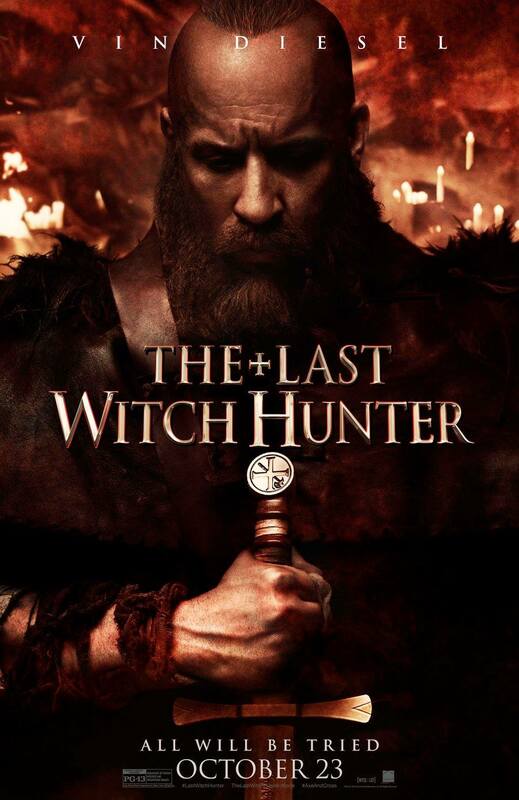 The warrior Kaulder (Vin Diesel) is a witchhunter who has lost his wife and daughter, but works with the Axe and Cross during the Middle Ages. Kaulder and friends slay several witches on their path to the Witch Queen (Julie Engelbrecht). They eventually find her, and many are slain in the process, but not before Kaulder sets his sword on fire and kills her. In her last moments she curses The Witch Hunter with immortality, so that he may always live with his suffering. Fast forward to present day, where Kaulder is headed to New York to see off the 36th Dolan (Michael Caine), his representative of the Axe and Cross. The 37th Dolan (Elijah Wood), is eager to work with Kaulder, but also nervous of his personality. The Axe and Cross serve as a bridge between witches and humans, who operate in secret, and the priests execute those who break the law. When the 36th dies, the 37th immediately take over duties. Kaulder goes to investigate the 36th’s apartment, because something is off. He learns that the place has been cursed, and dark magic indicates foul play. After visiting Max Schlesinger (Isaach de Bankole), a shady man who works with witches and warlocks on occasion, Kaulder determines that Max gave something to a warlock called Ellic (Joseph Gilgun). After capturing him, Ellic is deemed guilty by a council of witches and imprisoned. Kaulder and 37th go to see 36th’s body and realize he’s been cursed, and not dead. They can bring him back if they kill the witch that did it. The clues left the 36th left behind spell out “remember your death,” so Kaulder decides to visit a witch to enter his own memories. Chloe (Rose Leslie) runs a bar for witches. Kaulder enters the bar, and it immediately empties. Kaulder asks Chloe for a memory spell to remember his death. She concedes and he falls asleep. This is where he sees the tree the Witch Queen died on, and his own burned corpse, and suddenly wakes up to discover he has been chained to the floor by Belial (Olafur Darri Olafsson), a warlock. Kaulder breaks his hand to escape, but Belial lights the bar on fire. Kaulder and Chloe leave just as the place is destroyed. And freeze spell! That’s enough of that. Pros: The casting choices are fun and Vin Diesel always does a solid job as an action movie lead because he delivers his lines with authority and authenticity. It’s fast and fun, and exciting, at the ver the least. Cons: I’ve seen this movie before, one of them was called Constantine, and the other was called Highlander. A lot of the time I got the impression that the rest of the cast was phoning it in and the script drags on at times, proving the direction isn’t good enough. Points of Interest: The main character Kaulder is based off of Diesel’s real life D&D character, also a witch hunter. Julie Engelbrecht makes her debut with this film. This was a difficult review for me to write, because I like Vin Diesel in pretty much everything he does, but if I am going to give an honest review, the movie doesn’t have an interesting enough plot, good performances or properly executed pacing to keep most people interested. You can watch the movie once, but I doubt this will become a cult classic. Now, having said that, that doesn’t mean you won’t enjoy it if you go in expecting a medieval action flick with bad guy witches. So think on it and decide if want to get immersed in this character, dear readers. Otherwise, I’ll be back tomorrow evening with something clever. I promise.